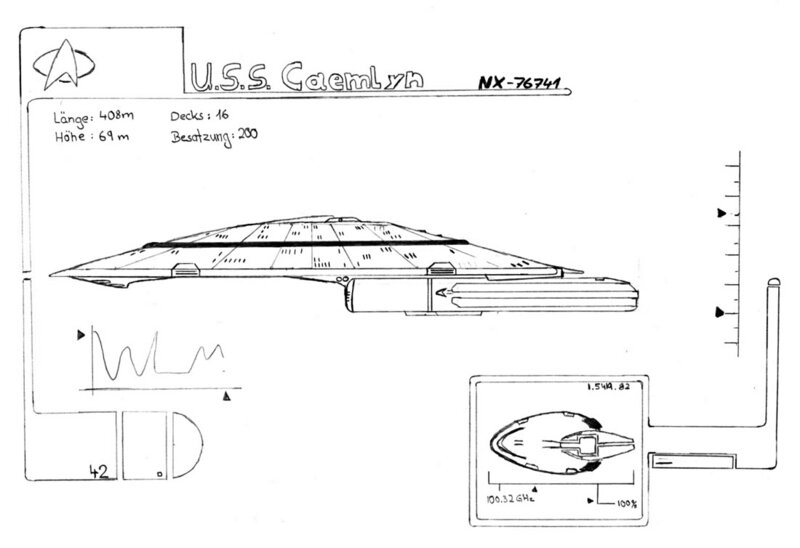 Commissioned at McKinley Station in the spring of 2376, the USS Caemly NX-76741 represents the prototype of a new class of high maneuverable cruisers. Equipped with a new experimental warp drive system the Caemlyn achieves a cruise speed at Warp 9.7. Her overall appearance follows the latest requirements in starship design with directly connected primary and secondary hull. The secondary hull is surrounded by the two unconventionally shaped nacelles with their very large Bussard collectors, giving the ship its unmistakable design. At the moment the ship is undergoing extensive field testings, mainly of the high advanced warp systems. Designed to take station on the edge of the Neutral Zone and eavesdrop on Romulan communications. 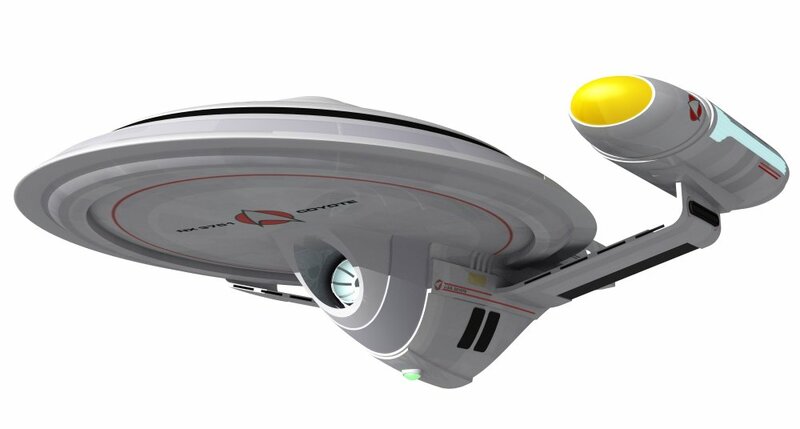 The Cardiff is fitted with a Vulcan-style annular warp drive and two massive sensor pods occupy the space normally taken by a Federation starship's warp nacelles. As the year 2375 came to a close Starfleet found fleet levels to be at its lowest numbers since the early 2300’s. 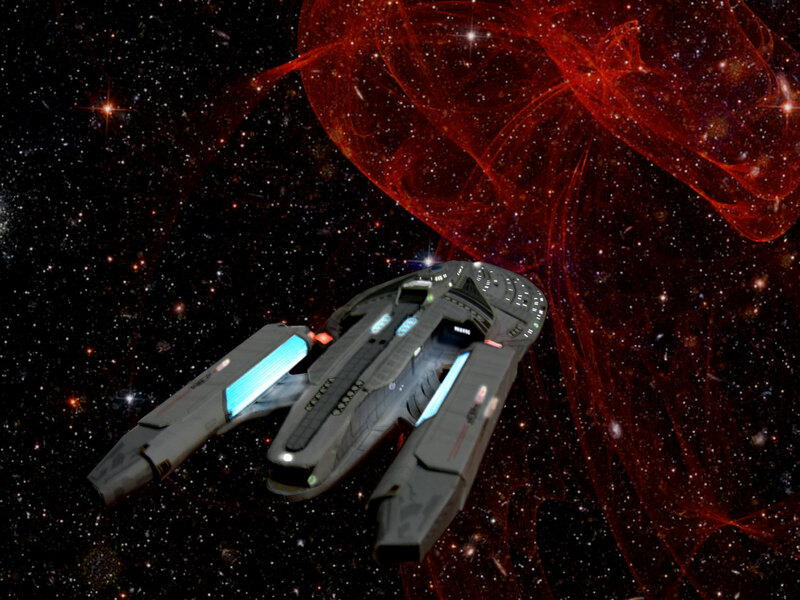 Repeated Borg attacks and the recently ended Dominion war had depleted Starfleet’s strength to a dangerous low. To make matters worse, existing ship classes had proven ineffectual to meeting the threats now posed against the federation. Aging Excelsior and Constitution based starships had been devastated by the Dominion, and even the newer Galaxy based ships were no match for the Borg. Starfleet command found itself uncomfortably vulnerable in the face of existing threats in the Alpha and Beta Quadrants and ongoing threats from the Borg. In the winter of 2375 at the request of Starfleet Command, Starfleet R&D began the Champion project. Until the shipyards and Starfleet Academy could rebolster the fleet to pre-war numbers, the admiralty decided to opt for quality over quantity. Starfleet R&D was tasked with designing a starship that featured the best features from the Sovereign, Prometheus, and Defiant classes, as well as be able to field test technologies brought back by the errant U.S.S. VOYAGER. Development began in December of 2375 and continued till construction of the first unit began in March of 2377. Block I The first six units of the new Champion Class would be built and deployed using conventional technologies that had already been tried and proven on other classes. Trial runs of U.S.S. CHAMPION began in May of 2379, and all systems met Starfleet’s requirements. Construction of the following 4 units continued apace and would be delivered over the next 3 years. Block II The next 15 units would be fitted with an auxiliary aft mount for sensor or weapon pods. In addition, 4 units would serve as test beds for new technologies brought back by U.S.S. 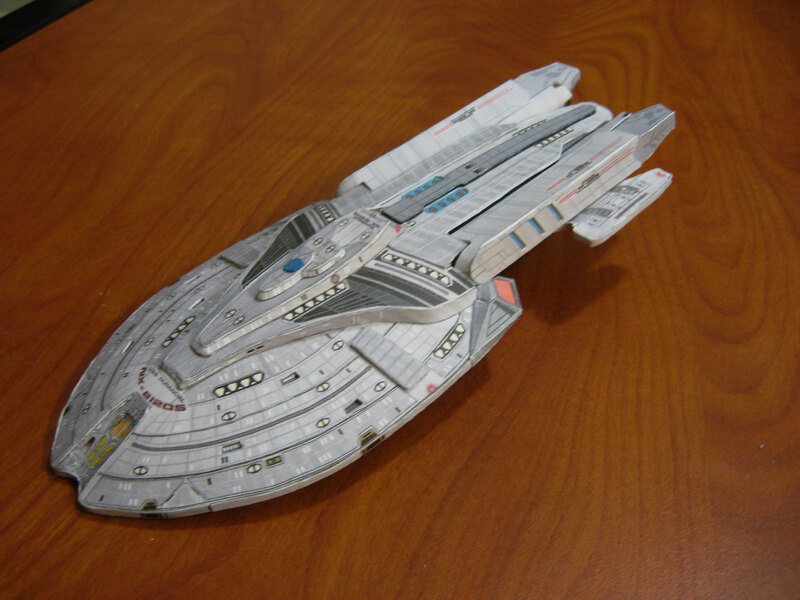 VOYAGER after her return from the Delta Quadrant. U.S.S. 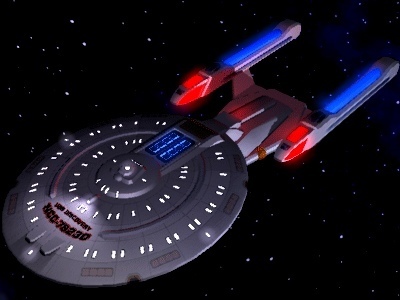 WARRIOR was mounted with a new ablative armor VOYAGER had acquired from a future timeline, and U.S.S. 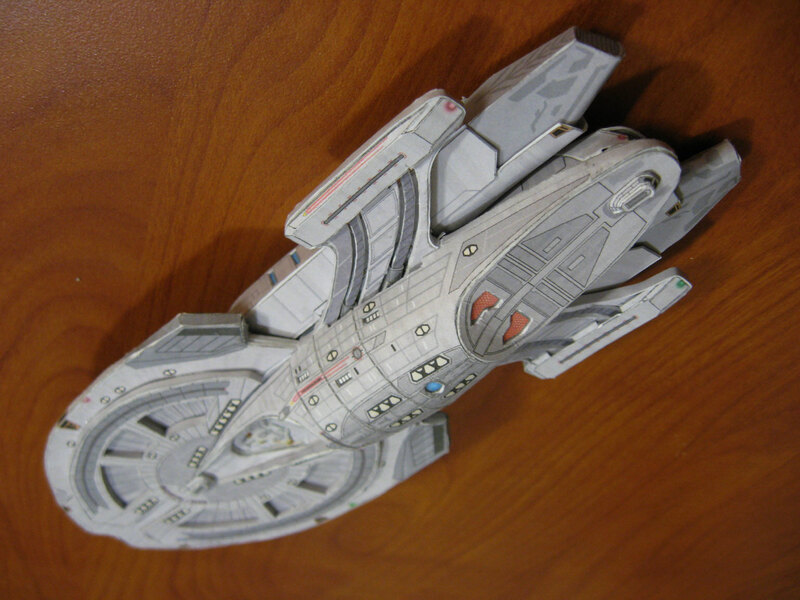 RANGER was fitted with a slipstream drive that had been provided by a Delta quadrant species. In 2367, Starfleet Command orders the primary design team at the Buklias III shipyards to develop a new class of starship to directly support the fleet in case of another Borg incursion. After the battle at Wolf 359, many lessons were learned in terms of efficient starship operation along with point defense strategy, close-in support for emergency evacuation and first strike analysis of tactical defenses. 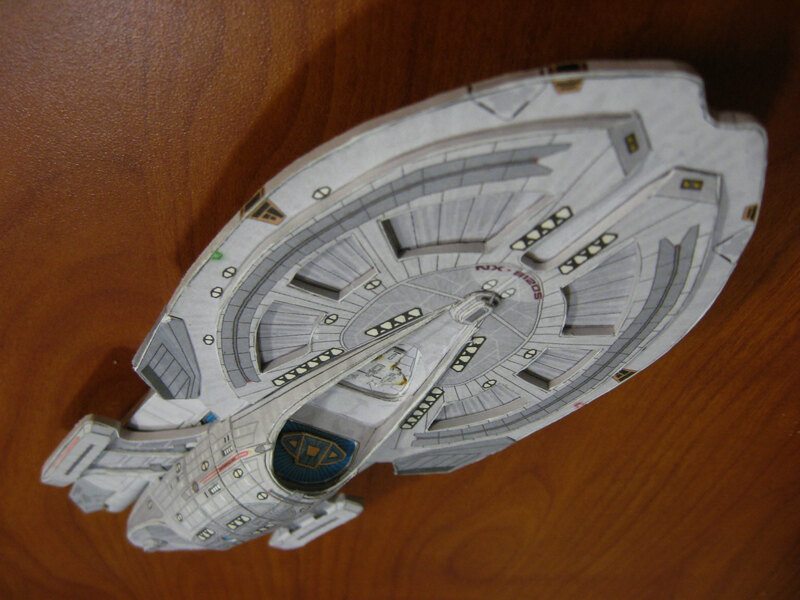 At the time, the only starship capable of surviving the longest in a fight with the Borg was the Galaxy Class, but considering the lengthy construction time needed to build such a ship, the fleet was vulnerable and with that, an advanced and efficient ship was needed to be built to help defend the fleet in the interim. During the previous incursion at Wolf 359, Starfleet engineers had already built and tested the Chariot Class but found that its current design needed an upgrade to compete with the current threat. Along with Starfleet Command's orders, the aging M.A.C.O. Command and the newly designated Tacfleet made suggestions as to how the Chariot Class could support their needs as well, so a compromise was made and with the continuing guidance by the Tellarite Union, modifications would begin to refit the Chariot Class to meet the newer demanding specs. 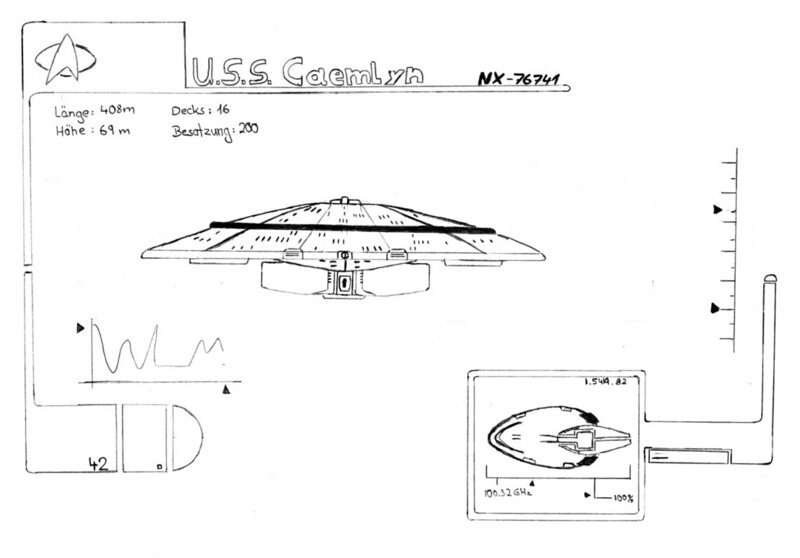 Several proposed designs were submitted for RFC (Request for Contract) to Starfleet Engineering and were scrutinized in terms of overall operation in relation to the proposed designs, or in layman's terms: "form following function". One design in particular that arguably became the final approved design, called for a more radical flow to the curvature of the primary hull or saucer section of the vessel. in the past, the bridge command module sat dead center to the centerline of the hull, providing ease of access to the lower decks by way of the turbolifts, but this idea was now abandoned in favor of a more forward position to the saucer hull, providing more dorsal space for potential shuttle and fighter bay access, which had been on the minds of Tacfleet and M.A.C.O. for quite some time and had been argued in the past whenever a new vessel design was proposed. Their arguement was that most, if not all ships had aft shuttlebay access in the vessel, but in times of quick launch of shuttles and/or fighters, time was of the essence and launch times were compromised due to the vessels compartment layout. With the new design under review, M.A.C.O. agreed upon a hydraulic controlled recessed landing platform, which would allow for quicker launch and landing capabilities for first strike craft. The main shuttlebay, located on decks nine through eleven enabled craft to egress through the aft and forward bay doors in times of immediate need. With this new addition, flight operations control was moved to Deck One, inline with the main bridge. Another advantage was the close support of these defensive operations relative to the command of the ship itself. Flight ops controlled most of the critical flight systems of fighters and shuttle craft in times of war and the remaining bays in the secondary hull were independently controlled by their own flight operations. 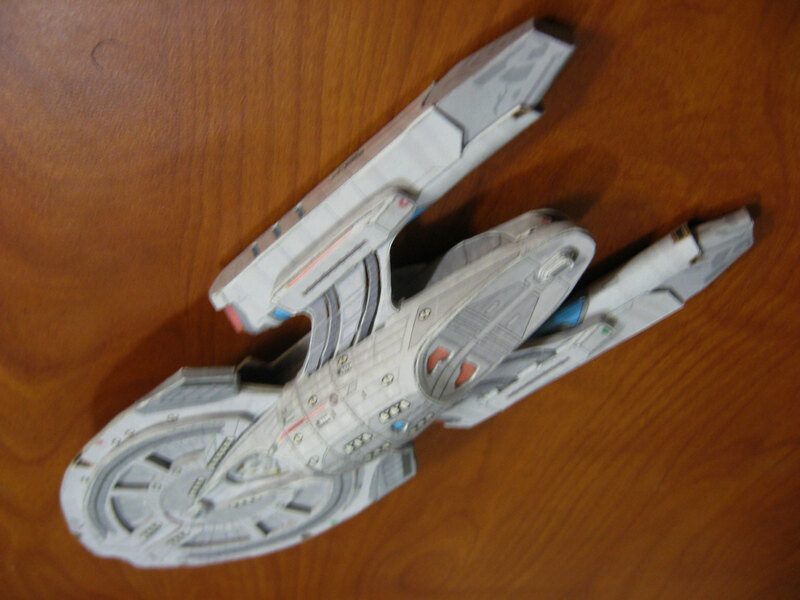 Another major design implementation was the position of the warp engine nacelles in relation to the secondary hull. Again, most starships in the past were placed above and to the rear of the primary hull with the nacelle pylons at 45 to 60 degrees of normal to the secondary hull. With a new horizontal placement of the engines and pylons, engineers were given more freedom with the placement of the warp plasma transfer conduits coming from the warp core, maintaining a horizontal alignment to the secondary hull and thusly, freeing up more compartment space for possible shuttle bays, greater deuterium storage tanks, general stowage, crew quarters, etc. Along with the new engine emplacements and their power transfer systems, the idea of installing two warp cores was given considerable thought. Once again, engineers and designers took cues from previous design deficiencies and realized one major flaw with the current power generation vs. usage which was significant power drain and/or failure during conflicts, spatial anomalies and other similar events that frequently occured during service. With a warp core down for maintenance and/or repair, reserve power storage systems were often run in low consumption operation, which could leave a ship defenseless if another event came about. The solution was to install a second core which unfortunately would open up a whole new set of issues that had to be overcome by the engineers. A-Synchronous power distribution nodes would have to be placed at regular intervals through the ship, positioned within the paths of power transfer and external power supply conduits. The main engineering computer would also need a major upgrade to compensate for the extra duty. Continuous cycling of the diagnostic computer routines were to be a standard function of the engineering computer along with split-second timing of catastrophic loss preparedness and redundant control nodes feeding the warp core subsystems. StarTech Technologies was ultimately awarded the contract to develop a newer model computer core system that could process multiple system commands to core ship function in fractions of a second, which would be a giant leap in technology for Starfleet vessels in the future. Transitioning from a Duotronic to an Isolinear system, took several years of development but when implemented onboard the Midway, operations became more efficient while error dramatically decreased. First observations of the Chariot's design revealed that there was a high percentage of wasted space within the secondary hull, which was quickly rectified by rearranging internal compartments to make way for more shuttle/fighter support. This pleased M.A.C.O. and they began plans for more fighter production and the introduction of their Tomahawk Class JSF fighter, designed in conjunction with Tellarite technology. With the implementation of five shuttle/fighter hangers, further integration of more berthing compartments and ship's services would also be needed, so again, space was compacted to accommodate the needs. Since the primary roll of the shuttle/fighter bays was to be for general operations, if the situation arose that emergency contingencies were in place, evacuation of all craft could be achieved to make way for transforming shuttle bay space into medical triage stations, extra berthing for evacuees and further cargo storage. Rotating shifts would be instituted for all pilots to fly with the ship during those times or be temporarily transfered to other vessels. 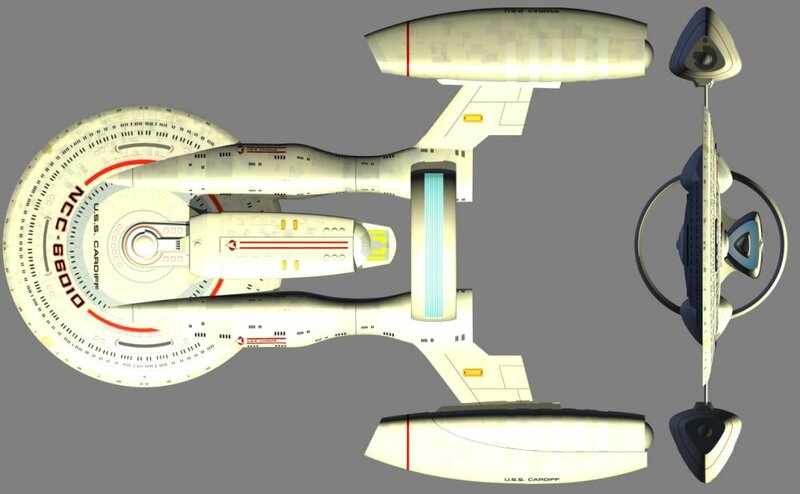 This design feature alone, set this ship apart from all other Starfleet vessels of the time and the Chariot Class would be known as the "Florence Nightingale" of the Fleet. Joint-Strike Operations was a new department introduced to the fleet with M.A.C.O. taking the lead for command in wartime situations. Operational services and accommodations would also be needed so designers created a new primary hull design which would hold operation compartments for M.A.C.O. Command staff allowing them free reign for wartime strategic planning and coordination of their troops and fighters on the battlefront. upgraded communications, offensive and defensive sensor suites were in place to make the new vessel not only a formidable vessel to the enemy but a primary strategic vessel in any fleet. Since combat efficiency was rated high on the list of issues that needed to be addressed, M.A.C.O. suggested an upgrade to all weapons systems so a newer type of phaser array was implemented along with more efficient launch capabilities of the photon torpedo tubes. Separate point defense countermeasures launch assemblies were built to help take the load off the torpedo tubes in case of a "fight or flight" scenario, thus making the vessel more efficient in offensive and defensive situations. Current warp engine design hadn't changed much since the inception of the Galaxy Class and its accompanying M/ARA propulsion systems, but since the Galaxy Class had issues with an overage of mass in space and its maneuvering capabilities were subpar at best in a fight, those systems were implemented into the Chariot Class and with its advantage of being more maneuverable by design, it could not only act as a command platform in wartime situations, but if after releasing its entire salvo of shuttles and fighters, could also act as a frontline strike vessel. With its advanced communications and intership "Hyperlink" data transfer (which had a discriminate .0001 delay), no other ship in a given fleet would be without necessary information at any given point in time during battle. The on-board JSO's primary responsibility was to stay in constant communication with the fleet and also receive updated command orders from the flagship as well. After design was approved and construction took place, Starfleet could see that they did indeed have one of the most efficient and advanced starships in their arsenal. Some considered the Chariot Class refit to be "one well oiled machine" when it came to operational improvements and they gained further optimism that if one day that another Borg incursion happened, Starfleet would be prepared. Construction refit took place in 2368 on an existing vessel in the yards. Timing was crucial at this point as the ship was in waiting for its warp engine fitting. Current design production was halted and the implementation of the refit orders came through. It only took 23 months to refit the ship and test all systems. 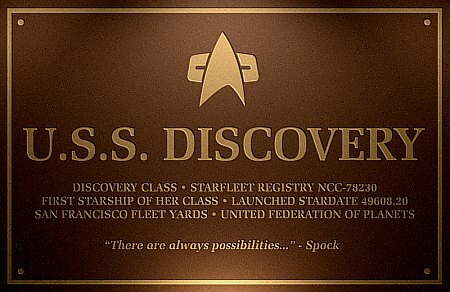 Commissioning was done in a quiet ceremony at the shipyards but enthusiastic applause was heard around the quadrant as the newly named U.S.S. Midway was on her way to make history. Command codes were transfered from the Dockmaster to Tacfleet Commodore Brendan Verago as well as M.A.C.O. General Jack Rothford and the Midway's first assignment sent its crew to patrol the Buklias System while on battle alert. To this day, there are seven Chariot Class vessels in operation, each assigned to the remaining fleets within Starfleet. 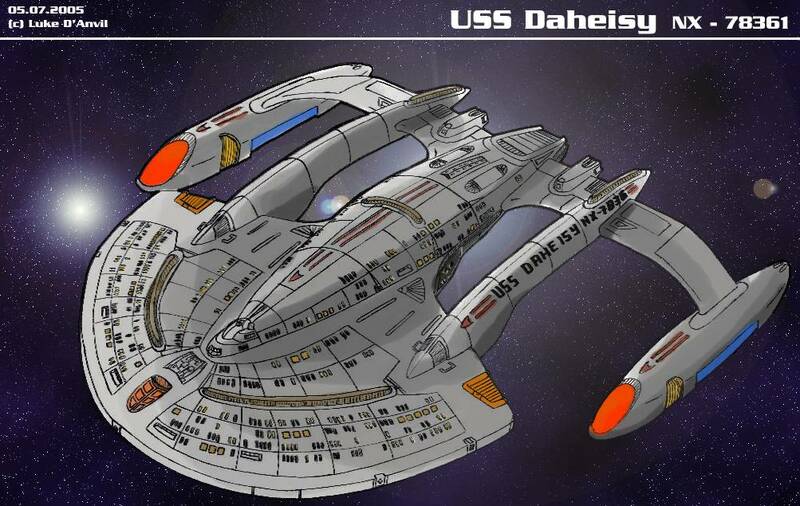 There is a bit of secrecy surrounding their service to protect the fleet and Starfleet has denied their existence to protect their valuable asset against any and all enemies of the federation. 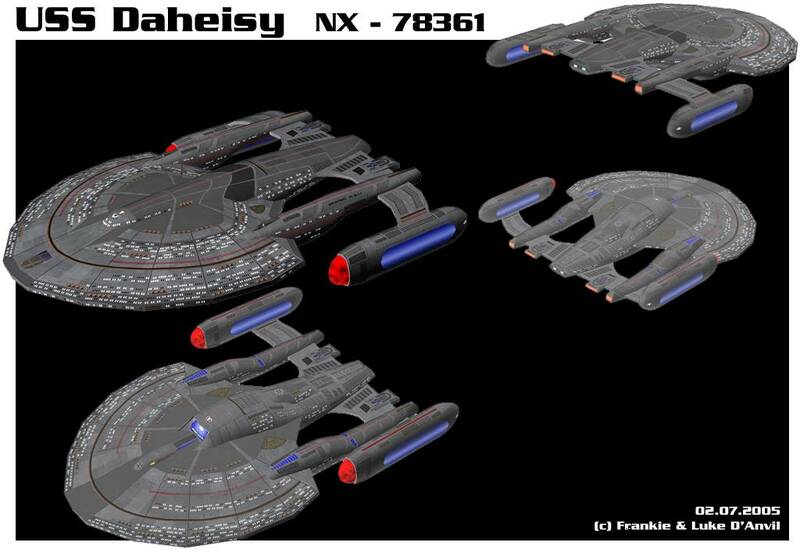 This ship is based on an original design created by Christopher David Reyes (aka Atolm/Azel) and a mesh by Howard Day. It was used as a basis for the Chariot Class refit which was designed by Jim Morvay. Log in to protected area with user="guest" and password=<Riker's middle name> to download detailed plans of this design. 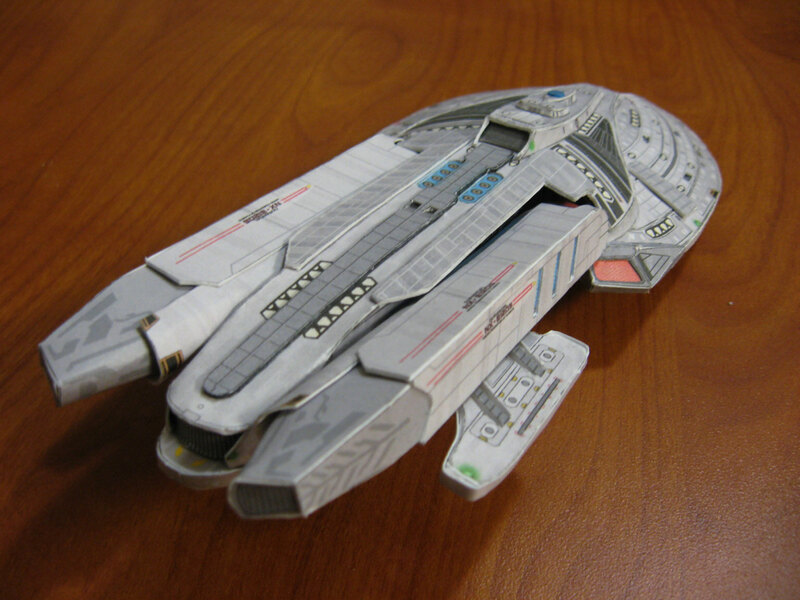 See the latest version of this design, including cross-sections, at astristech.deviantart.com. 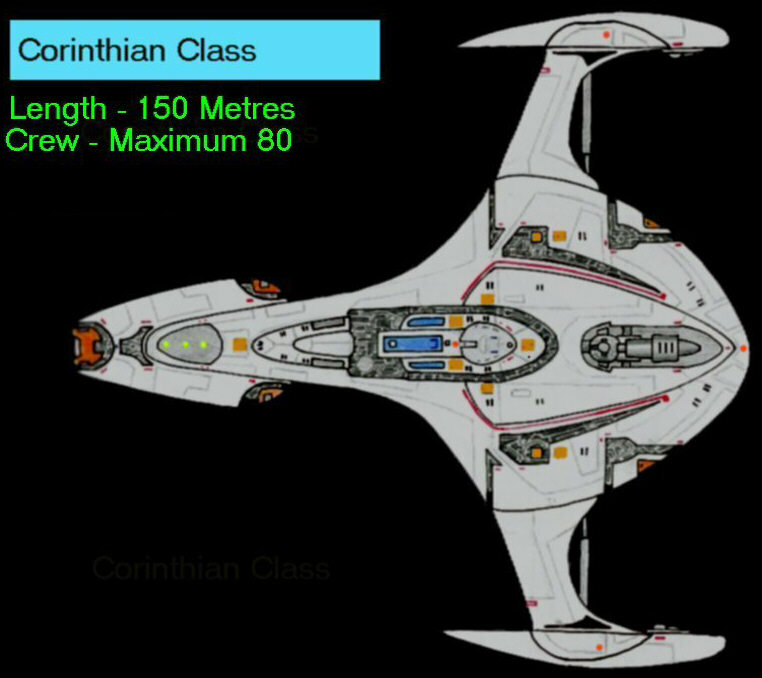 The Corinthian class is an experimental prototype Federation vessel incorporating captured and adapted Borg technology. The structure of the metals through the hull are loaded with Federation nano-probes based on the Borg template, they assist in keeping the structure sound in concert with the upgraded SIF through the huge demands placed on the ship from combat manoeuvres. They can upgrade the materials at a molecular level in seconds to adapt them for the different requirements of high speeds, atmospheric landing, combat or stealth missions. The ship has energy output grids all around the hull which enable weapons, sensors, transporters, cloaking fields, holographic decoys or anything required. Most of the abilities are untested at this time. In the aftermath of the Borg incursion of 2366, some commentators saw parallels between the the Borg’s aggressive assimilation of new species and the Federation’s policy of cultural integration. They pointed out that when the Federation encountered cultures that were unwilling to integrate – the Romulans, Klingons, and Cardassians, for example, and arguably even the Borg Collective itself - the result was often war, followed by a period of détente and the eventual subsummation of that culture into the Federation. This, they said, demonstrated how the Federation was failing to live up to its ideal of “infinite diversity in infinite combinations”; some even went as far as to draw comparisons between Starfleet personnel and the Borg Collective’s drones. Starfleet’s response to these criticisms was to commission a new class of starship. The Coyote-class ships – Coyote, Anansi, Monkey, Loki and Twm Siôn Cati (each named for a Trickster figure in human mythology) – would have just a single crewman; an individual whose psychometric profile would normally have excluded them from selection for Starfleet operations. Beneath the bridge, the primary hull of a Coyote-class ship was given over almost entirely to a single large holodeck. The holodeck could, on demand, generate any facilities the crewman might require – living quarters, sickbay, laboratory – even company, if needed. This innovative design philosophy resulted in an extremely compact warp field geometry, freeing up power for holodeck operations. Furthermore, because the holodeck could generate a high-resolution recreation of any planetary surface imaged by the orbiting ship’s sensors, beaming-down could be rendered unnecessary in most circumstances. The project enjoyed some notable early successes. But in 2376 the crewman of the USS Anansi deliberately drove his ship into an unnamed planetoid at a high percentage of the speed of light, shortly after sending a garbled message reporting the discovery of mysterious, “non Euclidian” archaeological ruins there. Both ship and planetoid were completely destroyed. Following this incident all remaining Coyote class ships were recalled to Fleet Headquarters and the programme was quietly discontinued. 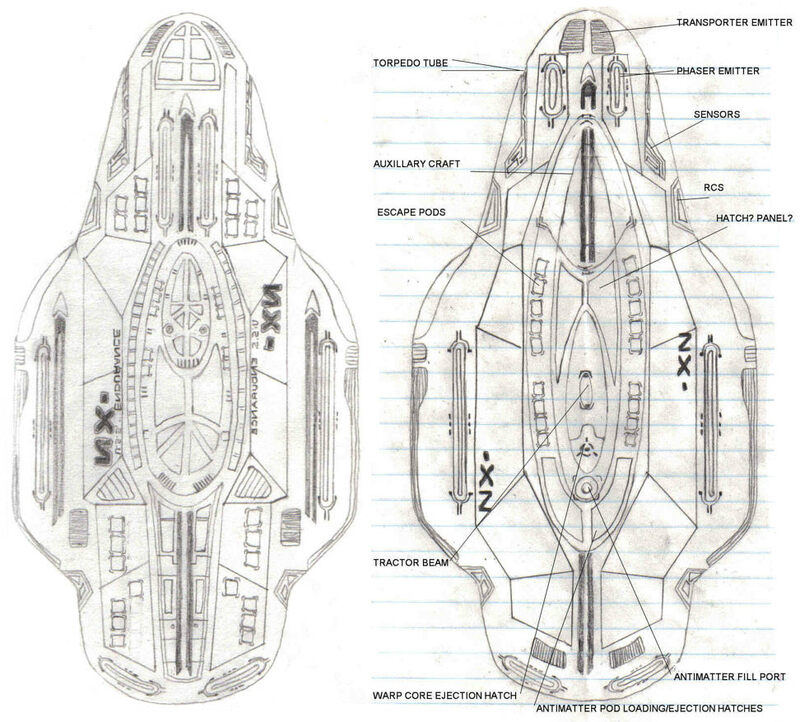 Design Concept: To serve as a covert-ops and command control vessel for the newly-formed military wing of Starfleet. Despite Starfleet's mandate to not be a military organization, the Federation Council overwhelmingly voted to add the unfortunate, but vital, component to the organization. This, after the return of Voyager and her crew back to the Alpha Quadrant, was done in response to the renewed threats of the Borg, and other hostile species, both known and unknown. 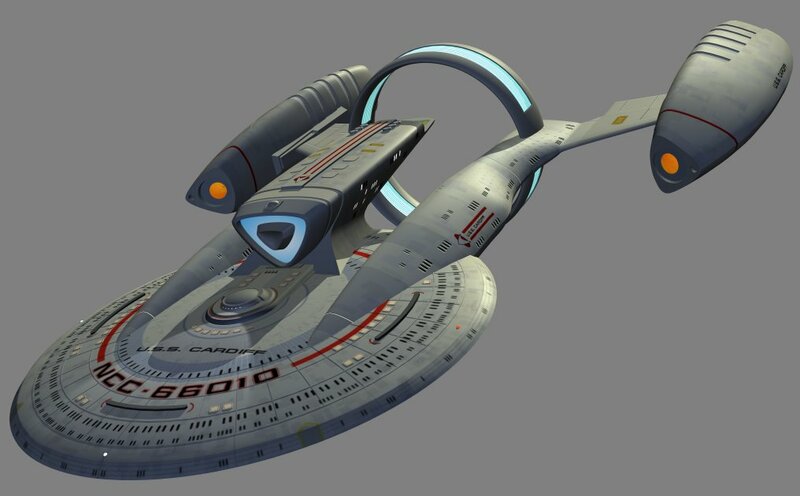 The new Starfleet Defense Service has designed the Crucible class starship to meet multiple requirements for a new, purely military, starship that has the best in speed, firepower, maneuverability, and stealth. During the seven years in the Delta Quadrant, Captain Janeway and her crew were forced to innovate and adapt as they tried to survive the journey home. Voyager itself was modified extensively throughout their journey home, Borg-inspired weaponry, slipstream drive, and other enhancements have made their way from Voyager's jury-rigged systems, to fully enhanced integration into the new ship. Aside from Voyager's contributions, other features have been incorporated. An improved impulse drive system gives the ship greater speed without going to warp. At normal impulse speeds, or during warp, the untapped power can be used through new IMCs (Impulse Maneuvering Cells) or redirected to any other ship systems. Another feature is the new pair of inboard warp pods. These pods supplement the primary nacelles during warp, or stand alone as backup nacelles when the primaries are off-line. The inboard nacelles are also capable of cycling the magnetic energy generated by the warp field back and convert it to impulse power. After the end of the Cardassian War, the Romulans and the Federation re-negotiated a portion of the Treaty of Algeron to allow Starfleet to use its transphasic cloaking technology in the development of the Crucible class starship. Also, emphasis was put on making the Crucible class ship capable of supporting a limited number of fighters and dropship troop craft during required operations, along with its own missions. Lastly, the value of integration of biology and technology (with full attention to ethical restraints) was imbedded into the ship's defensive systems through an interface mechanism especially designed for an “enhanced” operator. This operator would provide a humanoid capacity to ship systems by using the inherently quicker reflexes and processing power that computers have yet to emulate. The return of the U.S.S. Voyager and the techniques attained thereby made a reconsideration of current developments necessary. The Prometheus project was resumed, had to be updated however. The resource scarceness caused by the Dominion War led to the situation that only a few ships received these partial untested improvements, some even only for test purposes. Starfleet Command decided to begin the building of new ships again. 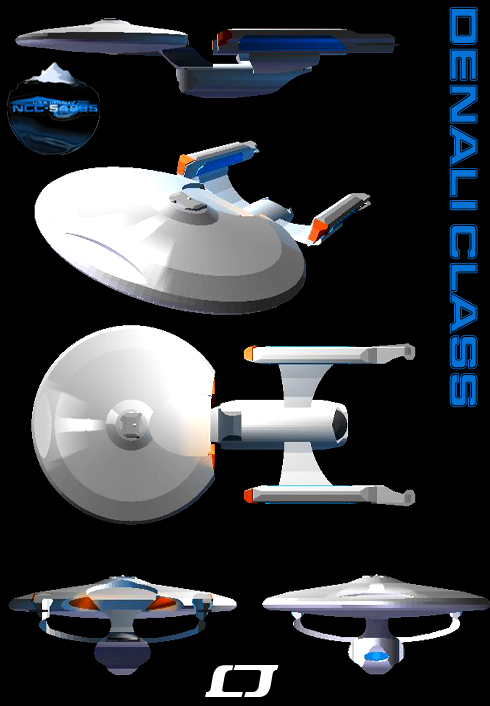 Up to a few modern classes as for example the Defiant -, the Sovereign- and the Prometheus class, Starfleet decided to stop the production of further frameworks of the well-known types. Utopia Planitia received the honorable order to design a new multi-functions-ship to contain all new adapted, experimental and matured techniques and components. 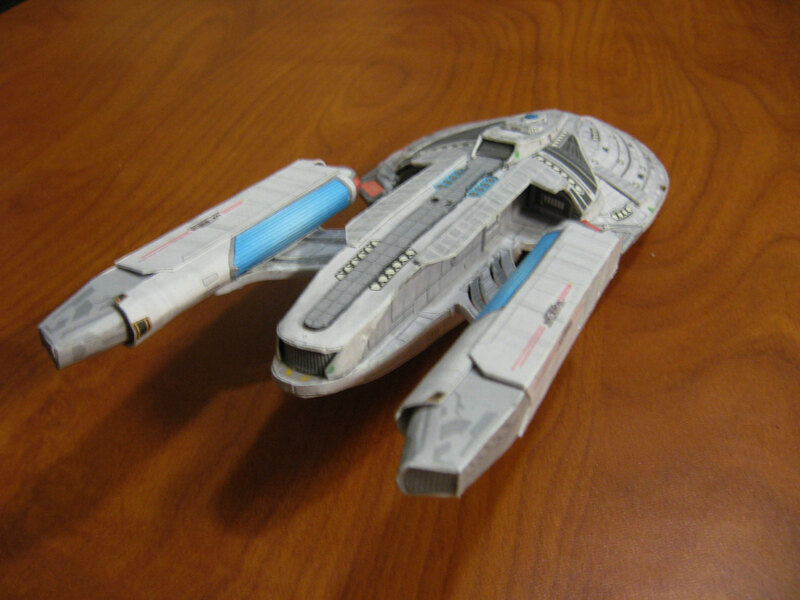 For test purposes Transwarp drive and Slipstream were integrated, which saw the fleet command in both possibilities to enough potential to achieve a break-through. In the framework and the hull of the ship more resistant Tetraburnium component were integrated, and the hull - if the ablative-device should be malfunctioning - was equipped with standard ablative armor. In critical moments the Tom-Paris-emergency-bulkhead-system provides for surviving the crew on the inside of the Daheisy and can reduce a loss of the structural integrity. The shield technology is a combination of newest Starfleet technology and Unimatrix-Borg components. The use of all this new component makes the prototype unique. If it should show itself as error-free, easily producible and resistant, it would be possible that this new ship type is established as a standard ship of the fleet. The indications stand well, if one considers how Starfleet maintained ground against the Dominion and the Voyager against the Delta quadrant. The place of residence of the ship, built in just one year, is unknown, since Starfleet learned from the Prometheus incident. 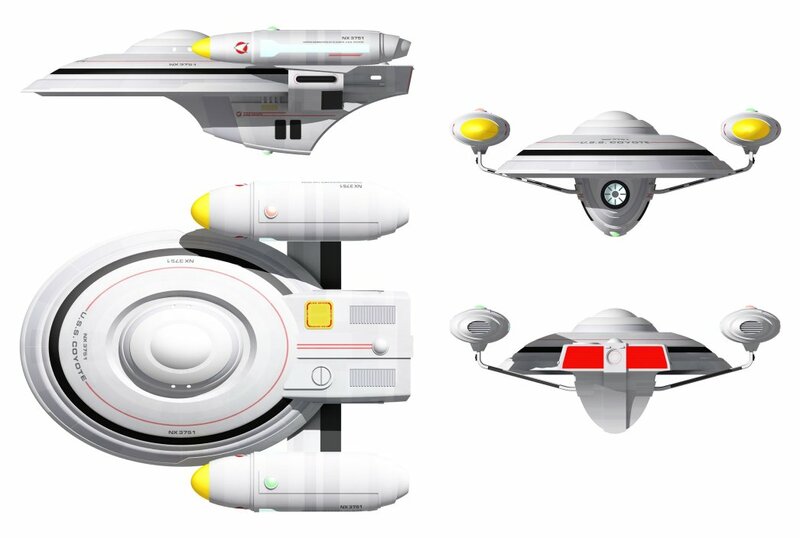 Originally supposed to be a light science vessel, the Discovery class design was changed significantly during its development due to the growing threats throughout the galaxy. It now serves as a supporting light cruiser to larger fleets or, if operating alone, as a diplomatic vessel that can defend itself in unsafe environments, as well. The prototype, the USS Discovery NCC-78230, made it through all stages of testing and is now serving as a regular ship in Starfleet. As Starfleet found itself involved more and more in combat situations, especially those involving the Borg, as well as outright war with the Dominion, the demand for more battle-capable ships grew. The Durandal project was one of many started after the Battle of Wolf 359, in anticipation of future Borg incursion. 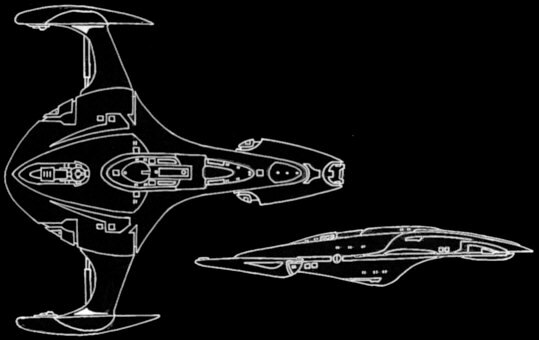 Starfleet wanted a vessel with more firepower and better survivability during firefights, but quickly realized additional armor and shielding were ineffective adaptations against the Borg, and like many of the projects, was halted in 2369, before serious development past the design phase had begun. The design was only revisited in 2374, after "Operation Return", when Starfleet realized there was a need for ships capable of breaking through large fleets or blockades, much in the way the USS Defiant had against the Dominion. To accomplish its mission as a blockade runner, it was determined Durandal would need more firepower oriented towards the vessel's front. 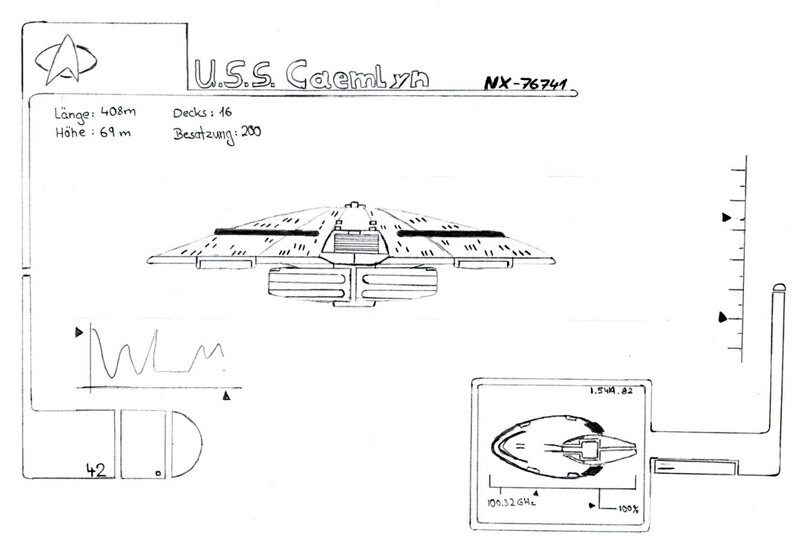 A compact layout and smaller profile to help minimize hits from enemy vessels was also specified, as well as extra protective measures to ensure function of the warp drive after breaking through a blockade, and redundant impulse systems to ensure propulsion despite damage. 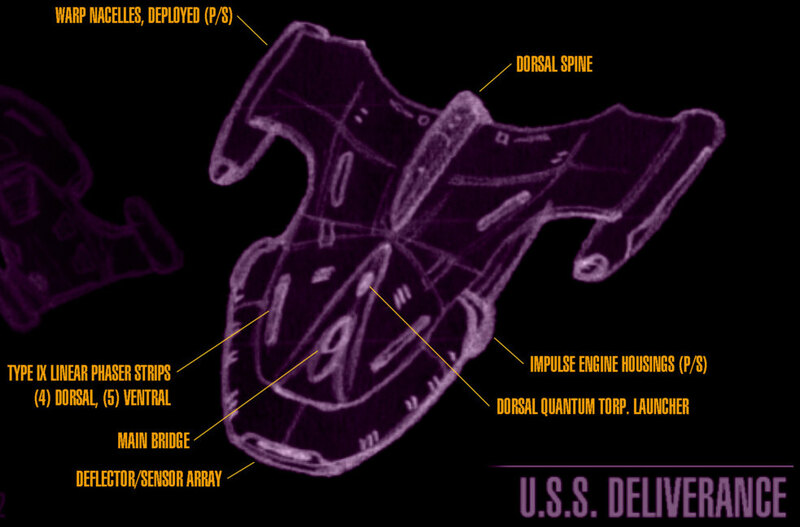 To augment Durandal's forward firepower, the design team revived the phaser turret system that had been used during the 23rd century, installing eight pulse phasers much like Defiant's on such turrets near the bow of the ship. While these turrets allowed the pulse phasers a wide range of fire, they were positioned specifically to allow concentrated fire on targets to the ship's fore. Standard phaser banks were still installed to protect the rest of the vessel from all angles. To ensure the survivability of Durandal's propulsion, it was given three separate impulse reactors, feeding four impulse engines. 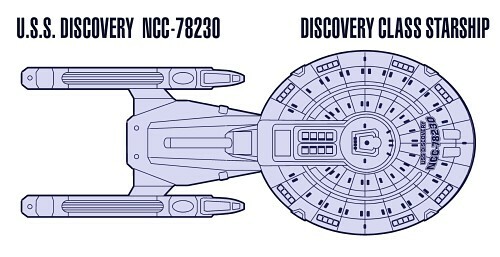 To ensure operation of the warp drive, Durandal's warp nacelles were to be encased in far heavier armor than most starships sported, but the increased mass caused resulted in a slower vessel, and with standard nacelles in the conventional raised pylon position, projections still showed them to be a major weak point, even with the armor, because of their prominent position in the ship's profile. The solution to this issue was to install tracks on the nacelle pylons that allowed the nacelles to retract into berths in the secondary hull, where the more vital areas of the nacelles were protected by heavy armor on the secondary hull. The outer sides of the nacelles still received heavy plating, as they remained exposed while the nacelles were retracted. The result was a significant increase in the survivability of Durandal's warp drive. When retracted, the nacelles were not only better protected, but also made much less opportune targets from most angles. 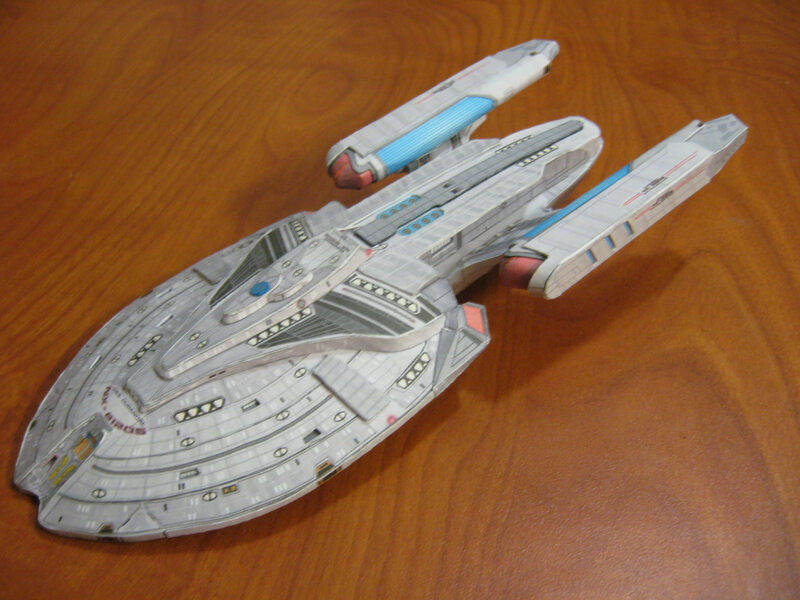 The retraction of the nacelles also allowed a decrease in the surface area of the vessel's deflector shields, delivering more power over a smaller area. 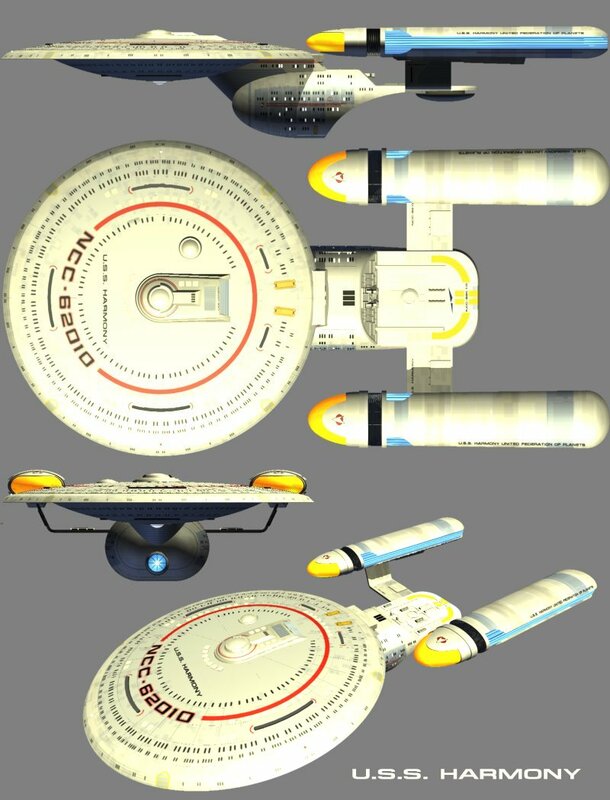 Starfleet engineers also took advantage of the proximity of the nacelles in retracted mode, and built in additional EPS connectors that could augment the ship's power grid with warp plasma while the nacelles were retracted and not in use. While operation of the nacelles in retracted mode was deemed inadvisable due to stresses on the hull, and problems with the geometry of the warp field, Durandal can engage its warp drive with the nacelles retracted in times of emergency, and extend them once at warp. 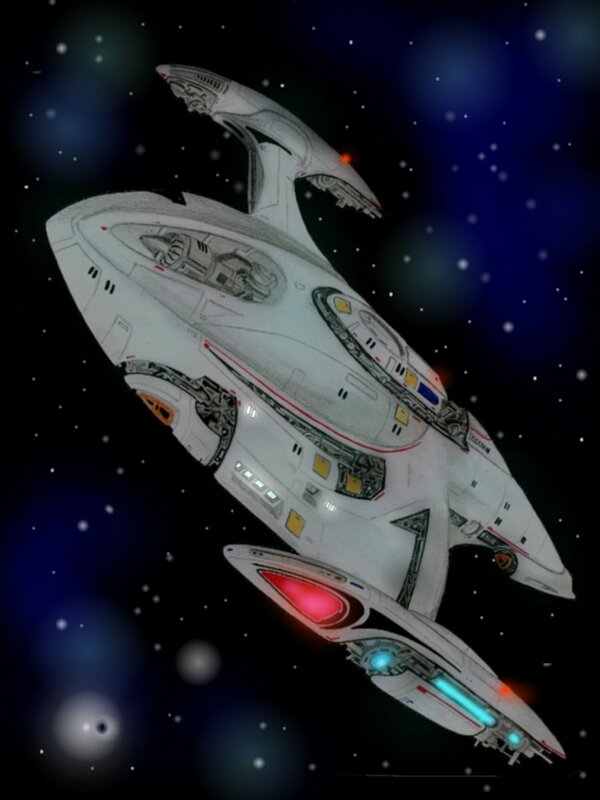 Safety limits the operation of the warp drive with nacelles retracted to 3 hours at speeds below Warp 5. Safe operation time decreases exponentially for speeds above Warp 5. While considerable thought was given to the inclusion of a secondary warp core for emergency use, it was ultimately removed from the design due to the many significant complications such an inclusion would incur. 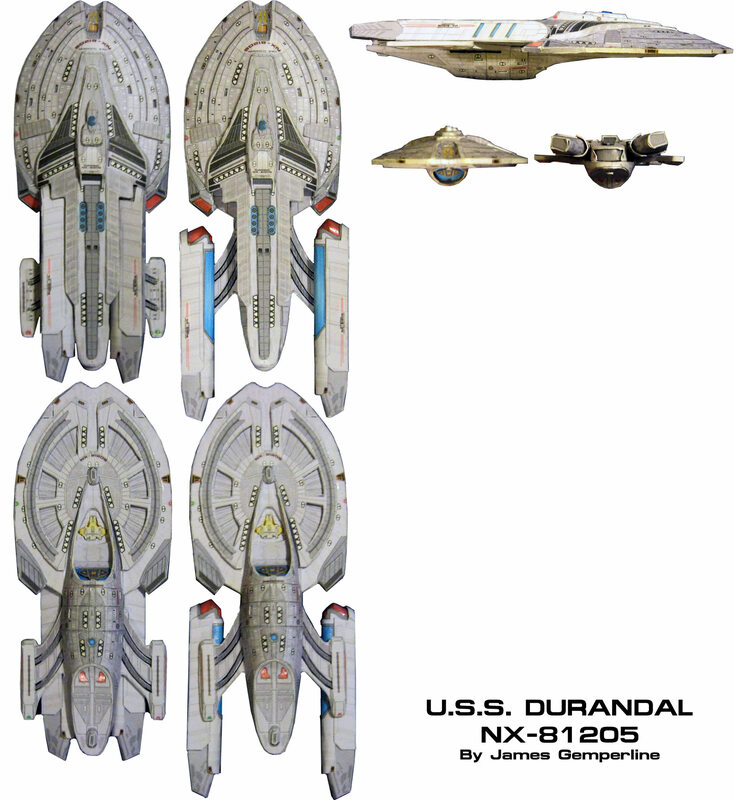 Thus far, only four Durandal class starships have been commissioned. Thanks also to Robert Gilbert for help with the concept design. 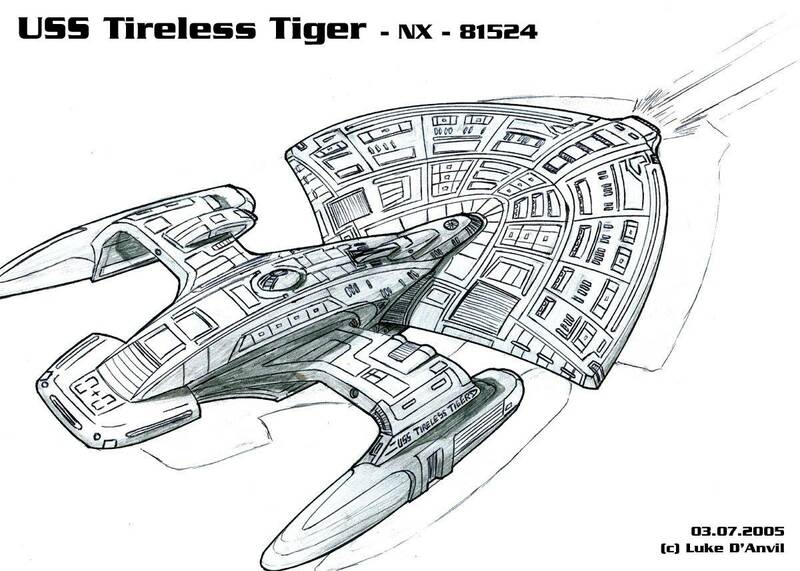 The USS Tireless Tiger is a modern, experimental and, above all, heavily armed battleship of the Egdar Allen Poe Class, conceived as an answer to the Borg threat. After first contact was made with this dangerous and aggressive species, the EAP project was developed parallel to the Defiant project. The original construction plans intended a heavy phaser cannon, different types of torpedo launchers, phaser arrays, pulse phaser cannons, an autotarget combat tower as well as space mines, which were supposed to make the ship ready enough to fight one of the deadly cubes in a squadron. The premises of the comparatively cautious, but for longer independent journeys conceived ship are distributed on eight decks in a more traditional design than the Defiant ones, and increase the value benefit by their optional extras, compared to the sister-project's. The progress of the conception, under the special direction of Prof. Bhoran Bhodan, only progressed moderately at first, when finally more resources were made available in order to accelerate the progress. At the beginning of 2366/67, the USS Raven was launched as a prototype and caused - in view of the problems with the Defiant project - great euphoria. The sense of delight about the new ship lasted short and ended suddenly after the first tests: The autotarget tower was too slow in practice, the pulse phaser cannons caused insufficient damage and, horrifying everybody, the the first shot with the Phase cannon sparked off a thermodynamic feedback loop, which completely destroyed the ship and killed all people aboard. The dissatisfying results, the loss of the ship, and mainly the sudden death of the prominent heads of the design caused Starfleet Command to store the second framework and classifying the project as failed. The remaining persons were called in to the Defiant project afterwards. The beginning of the Dominion War 2370 caused hustle and bustle: The test of the incident-involving partially successful and extremely impressing USS Prometheus, the practical experiences with the first and second USS Defiant, caused engineers of the corps - T'Lan Vorik ahead - to examine the data of the disaster of the USS Raven again. Vorik thereby hit upon some substantial energy-thermal miscalculations and solved the problem by adding a tellerium-cooling-core. Confronted with the Dominion War, Starfleet Command gave in its desire of having a additional possibly finished warship, and assigned her a team. The engineers adapted the final draft to the given time, solved the problem of the automatic turret by the use of bioneural gelpack sub-units, made the pulse phaser cannons combat-ready due to the experiences with the Defiant, and finally achieved a full operativeness of the primary weapon. Nonetheless, the small personnel capacities and the systemic general overhaul made the project progressing too slowly. 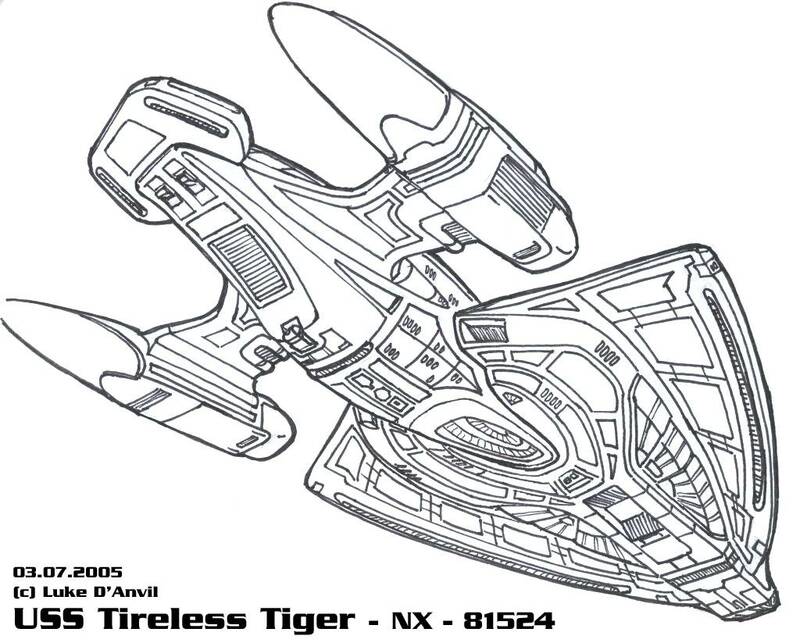 The war with the Dominion already came to an end and the Prometheus had gone back into the regular service when the Tireless Tiger was launched for first tests. 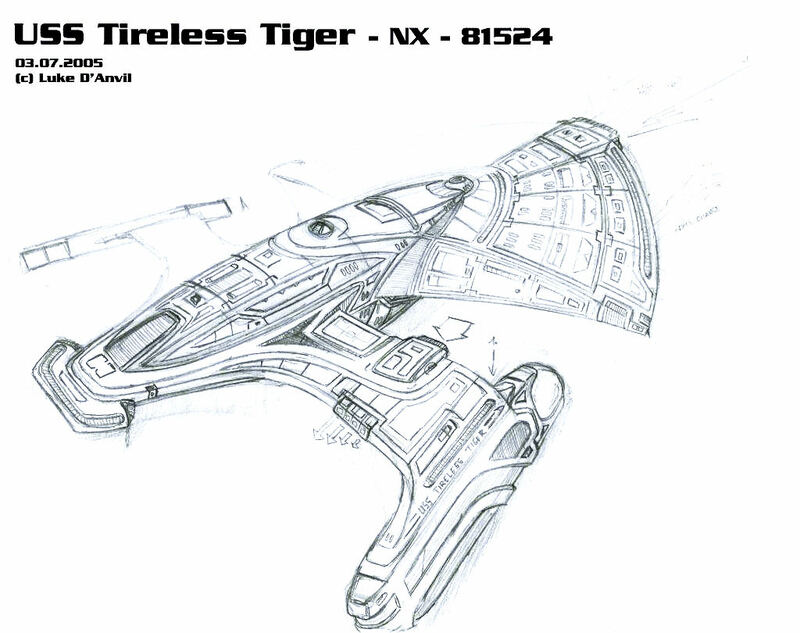 Despite the end of war, Starfleet Command decided not to abandon military advancement again: Because of the advanced independence of the ship, compared to the defiant, Starfleet decided to continue the Tireless Tiger project. Currently the team is testing the newly developed diametric shield grid, adaptive spatial space charge launchers, and a graded form of the ablative armor, which the USS Voyager brought along from the delta quadrant. The leading admiral Lombardi sees serial production approximately in one year, thus in 2381.